Ginda, Michael, Andrea Scharnhorst, and Katy Börner. 2015. "Modelling Science". In Theories of Informetrics: A Festschrift in Honor of Blaise Cronin, edited by Cassidy Sugimoto. De Gruyter Saur. Descriptive, analytical models of science are commonly used to calculate indicators and metrics, to identify trends, or to detect emerging areas of research. Predictive models of science use computational algorithms to simulate different future states—such as the future success of a researcher, the impact of different funding strategies, or changes caused by policy alterations. This chapter reviews computational models that aim to capture the inner workings of science. It starts with a general introduction of computational models of science. It then discusses challenges and opportunities that arise when attempting a bibliometric analysis of science models that were developed in different areas of science. Next, it introduces a novel bibliographic-bibliometric approach to delineating a set of relevant books, Word Cat subject headings, and Library of Congress Classification Codes that capture existing models of science. 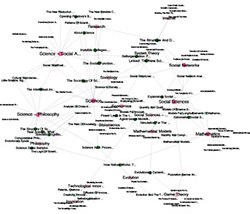 The resulting topic maps show the co-evolution of books, associated library classification systems, and subject headings related to scholarly works on models of science. 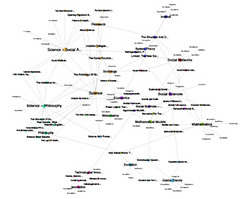 Figure 2: Subject heading and Book nodes colored by type, node and labels sized by degree. Figure 3: Subject headings and books with Blondel Communities highlighted.